When I was growing up, my sister and I were small and we didn’t eat very much. My parents were concerned, so they started sneaking extra food into things to get us to load up on calories. They mainly used American cheese to do this. One example includes Cream of Wheat, the ol’ breakfast staple made of farina — basically wheat gruel. Life is gruel, what can I say? Hey-o! Actually, life is loneliness. Then, you die. American cheese in Cream of Wheat is actually really delicious. Cream of Wheat by is basically a thick glue-like paste. American cheese makes it more like smooth cheese grits that is also like a thick, glue-like paste. Though, with people’s aversion to gluten (aka deliciousness) these days, I’m not sure it’s such a hot seller. The other item my parents used to sneak cheese into was French toast. They’d make us French toast sandwiches with American cheese in them – basically a Monte Cristo sandwich without the ham. And that too, my friends, is delicious. Sweet French toast is an abomination and I hate all of you who enjoy it that way. Hate is a strong word. I’m sorry. I love you. Take me back. I’ll change. I promise. I’m different now. But something my mom also did, was put cheese on instant ramen. I’m not sure when she started doing this, but it’s actually a pretty common addition to give your carby fried noodles some testicular fortitude. And she discovered that Muenster cheese was the way to go. Muenster is cheap, available at most grocery stores, and best of all — it melts perfectly. It stretches, it’s gooey, and it’s relatively neutral, perfect for a spicy bowl of noodles. My sister also came up with her own version, which has a slight crucial tweak. You know you’ve made it in the culinary world when someone names a dish after you, like Steak Diane, Eggs Benedict, and Guy Fieri’s Diarrhea Disaster. So it’s no small thing that I’m naming a dish after my lovely sister: Ramen à la Janit. Just to be clear, her name is Janet. Not Janit. I’m choosing Janit because that’s my secret name for her that sounds like her actual name when you say it. It’s a double secret name. First of all, you’ve got to get the proper ramen. Most people I know, including my father, prefer Shin Ramen, but Neoguri (which means raccoon in Japanese), is much better. No, it’s not raccoon ramen. It’s spicy seafood ramen with thicker udon-style noodles. To be fair, the noodles are nothing like udon, but who cares? It’s good! Also, I’d eat raccoon flavored ramen. 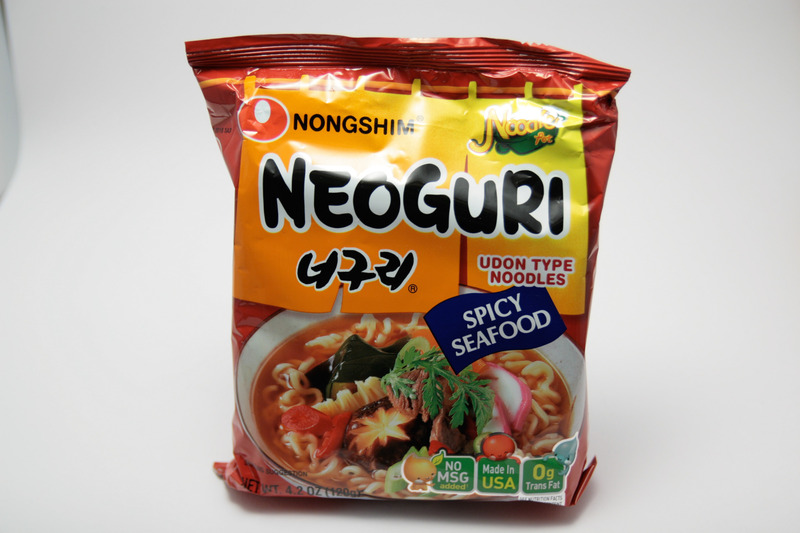 Neoguri has gotten popular enough that you’ll see it at some of the larger grocery stores around, but if you can’t get it, any spicy ramen will do. The non-spicy stuff is a little too bland for this wonderful treatment. I was a successful young man, graduated #2 in high school and went to Univ. of Chicago to pursue my dreams of riches. However, during school I quit and pursued a Rock Star dream instead. During the rock band life, the partying, the women and drugs, I became very wild and had many troubles and heart breaks. Once the police were chasing us, we prayed to God to save us. Miraculously, cops stopped chasing us. Then one day a friend invited me to his church so I decided to go. The pastor spoke as if he knew everything that was going on in my life and said if you have bad friends you will become bad also. I felt the leading of God so I quit the band that I was in for 3 years. However, I was still sleeping around with my 1-month girlfriend and I did bible study with her and even made her follow God. However, her ex-boyfriend who bought her car showed up one day and proposed to her taking her away! I got so depressed and yelled at God “why did you let that happen!! ?” Then I had an answer come to me “Because you loved her more than Me.” I realized my life’s focus was getting the hot girl & living in success. That is 100% straight from the pamphlet. There are lot of issues here, but mainly I think this packet describes my life very accurately. My life’s focus is also about getting the hot girl and living in success (sin). Prepare the ramen as instructed, except use about 2/3rds of the soup base since it contains 23894723984327% of your daily recommended intake of sodium and I don’t want you to die early. Pop the ramen in a bowl, and this is the key: My sister taught me to use very little of the spicy broth. As much as I love that MSG, only use a quarter of the broth. You’ll see why shortly. Then simply shred a piece of Muenster cheese and top the hot ramen with it, so it starts to melt. Poach an egg (easier said than done), and plop that bad-boy on top. If you’ve got company and you want to impress them in the hopes of a long-term relationship, and for some reason you’re feeding them a $0.69 package of ramen (works 100% of the time, by the way), a cool thing to do is sprinkle a little bit of the spicy soup base powder on top. If you’ve got some green onions, they make a perfect garnish. When you pop the yolk and mix it with the noodles, the broth will thicken up and become a luscious sauce, coating all of your noodles with joy. Yes, that’s it. Joy. And that Muenster cheese will melt lovingly, just like that girl/boy/other you’ve got over will, over that nice hot bowl of Ramen à la Janit. The problem in the last paragraph of that religious parable is an easy fix. The girlfriend didn’t leave him because he loved her more than he loved God. She left him because she forgot to get out of her car when she sold it to her ex-boyfriend. It wasn’t girl vs. God. It was girl vs. overly enthusiastic seat belt. Part of me thought it was because she was 1-month old. I am amazed by this pamphlet! wow. I have to share that when we were kids my brothers and I would shred so much queso chihuahua and pile it on top of spicy shrimp ramen. I crave this all the time. This is genius. Maybe I can do that one too! 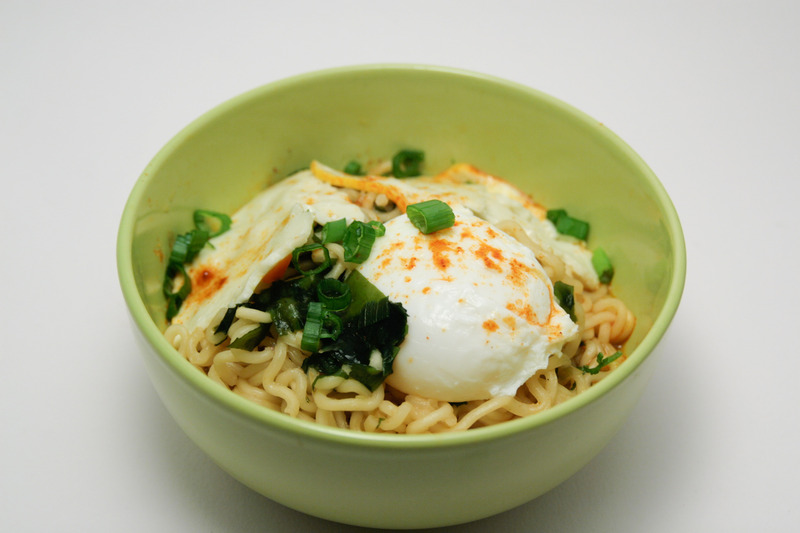 Have you ever tried poaching the egg IN the ramen broth? I have! It’s great that way. ABBEY THIS IS MAKING ALL SORTS OF SENSE NOW. Cats forever. Also I used a fancy cooking machine to do my egg but that’s just because I have it and that is why it is a very pretty egg just like me.